A gourmet outdoor kitchen featuring Butterfied Color stamps, integral color, stain, counter top admixture, form liner and molds. The outdoor kitchen at the Wehri residence in West Fargo, ND features a wide variety of decorative concrete products and techniques. Utilizing Butterfields Pro-Pack countertop admixture for the countertop surfaces, Gilpiin’s falls and heavy stone textures for the patio colored by Butterfield integral color and release. 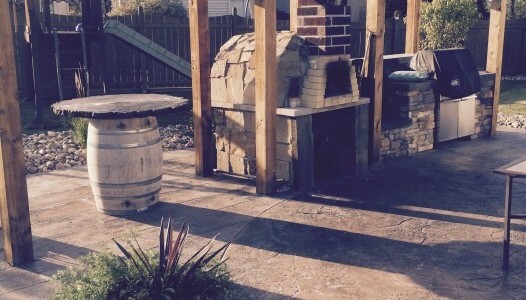 The concrete surfaces are complemented by a timber pergola, a hand made pizza oven and a built in smoker/grill making this back yard oasis a fully functional gourmet kitchen. Additional items used are Laticrete’s HP Spartacoat Spartaflex as a high gloss, abrasion resistant and UV stable sealer for the main countertop surfaces and Z-form’s 4” commercial edge formliner. The “log and barrel” top is an example of Butterfield’s 4” log round counter top mold and a re-purposed wine barrel for the base.